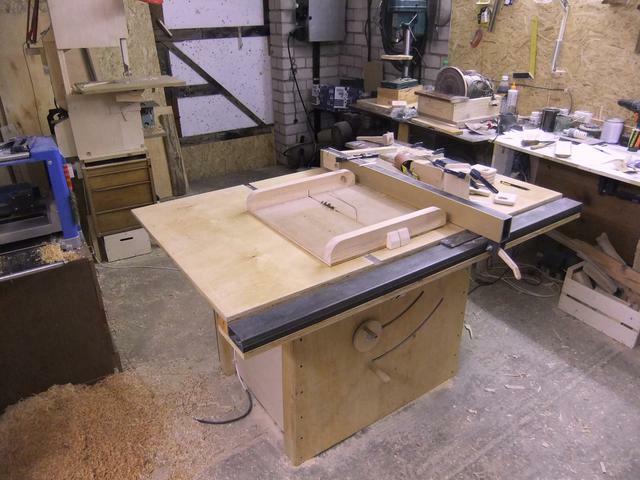 Here are some pictures of the table saw that I built. I started with the arbor. After many considerations (as it turned out - not enough) I came up with this idea and went to a local metal turner, who made this arbor for me. 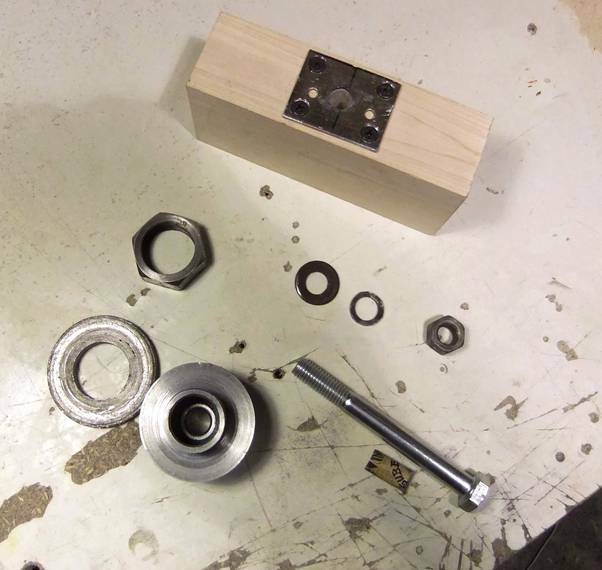 The arbor is very simple and convenient to mount, but it's not good: two ball bearings are pressed into a solid piece of steel that acts as a pulley for a V-belt and flange for a saw blade. Inner diameter of ball bearings is 12mm which is the worst part of this design because the main shaft (a M12 bolt) is too thin to be sturdy enough. In the beginning I had a lot of belt vibrations, which caused the saw bade to vibrate. After I got rid of them I use the saw quite successfully. The M12 shaft is probably a bad idea - too thin. Metal fatigue may cause that bolt to snap spontaneously after years of use. 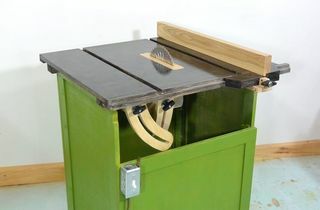 Between the drive belt on the arbour and the wooden cabinet, the blade should stay inside the saw if that ever happens. Progress of lifting and tilting mechanism. I used 22mm steel rods from car shock absorbers as glides. 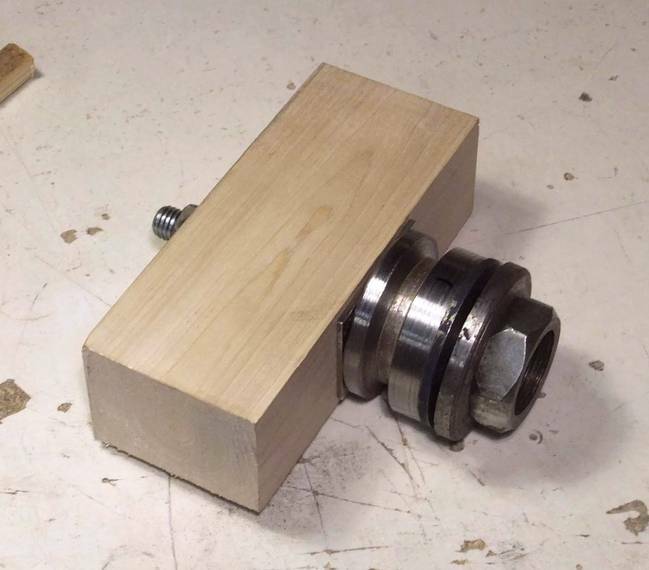 4pcs cheap Chinese linear ball bearings (which had lots of play, so I had to shim them so that they had tension against all sides) are pressed in a piece of oak along with two M20 nuts for threaded rod. I put those nuts so that the threaded rod would turn easily, but have no play. Where the threaded rod exists the lift mechanism there's a big ball bearing sandwiched between two thin nuts to act as a thrust bearing. Lower down on that rod goes the last piece - a small gear. The whole assembly can slide up and down pushing only on one end. At first I used only one bearing on each bar which didn't work out. 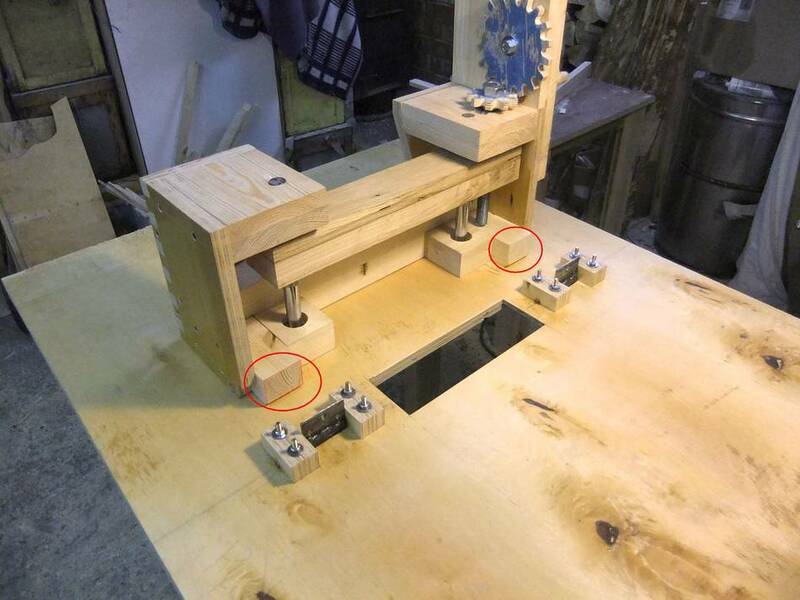 The mechanism would not move parallel and it would jam. 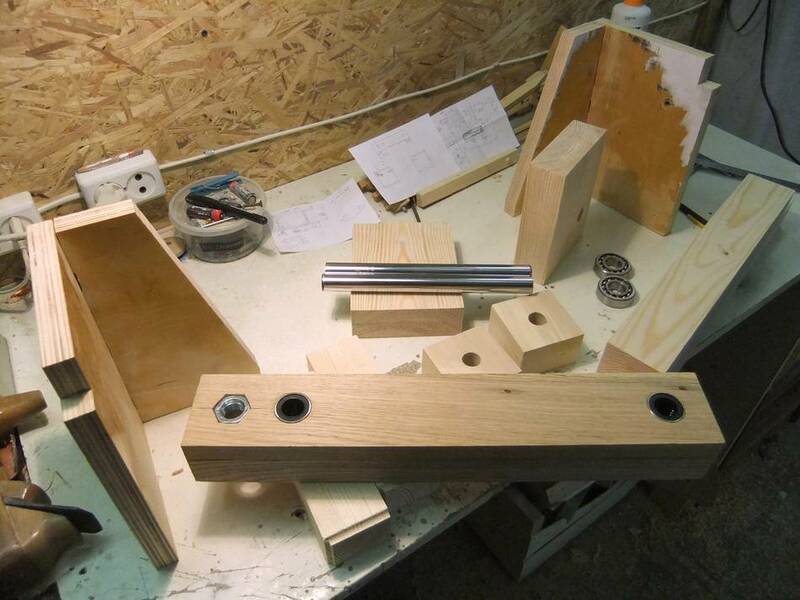 Then I added one more linear bearing for each bar and butted them against each other to get 15cm of bearing length, which allowed the sliding motion without binding. 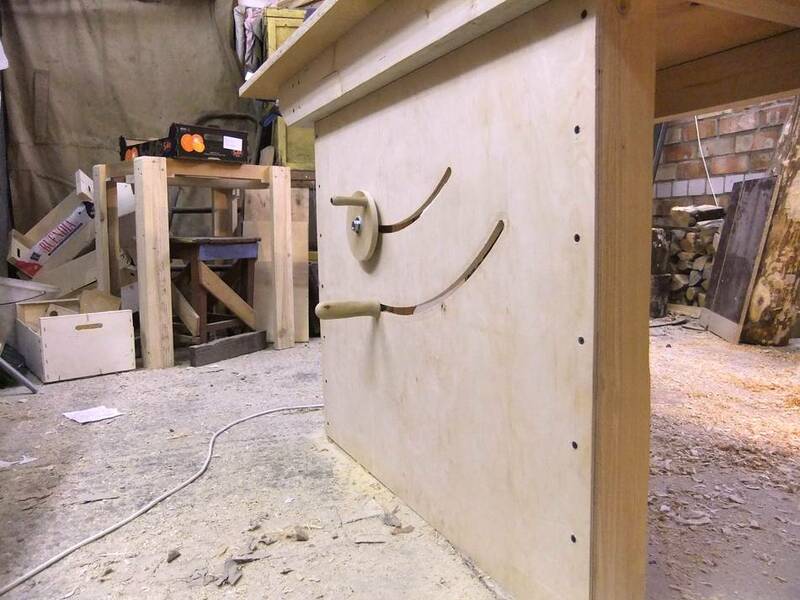 Above right, you can see the finished lift mechanism being mounted on hinges. The area that gets mounted on a hinge is circled in red. 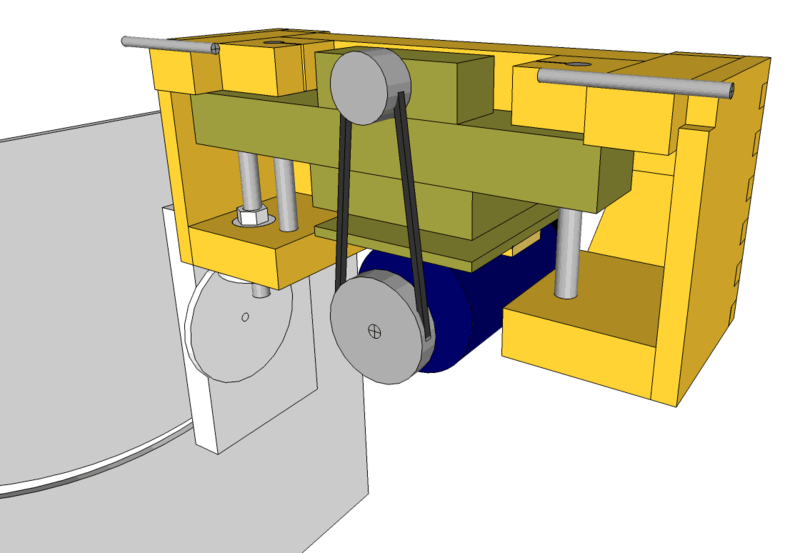 I also include an image from the SketchUp model, because I don't have a photo of a completely finished mechanism and I figured that it could be hard to see what is where. Here you can see the front of the saw with lift crank and tilt lock, which is another bad thing in this saw. Tilting on my saw is very hard. It takes time to set it correctly because you need both hands on that handle and no hands left to hold the angle while tightening. I saw John Heisz's table saw was made with the same type of tilt and I thought it couldn't be that bad, so I made mine this way. Now I wouldn't do that. That sort of tilt gets harder to operate the further the motor is from the axis of tilt. 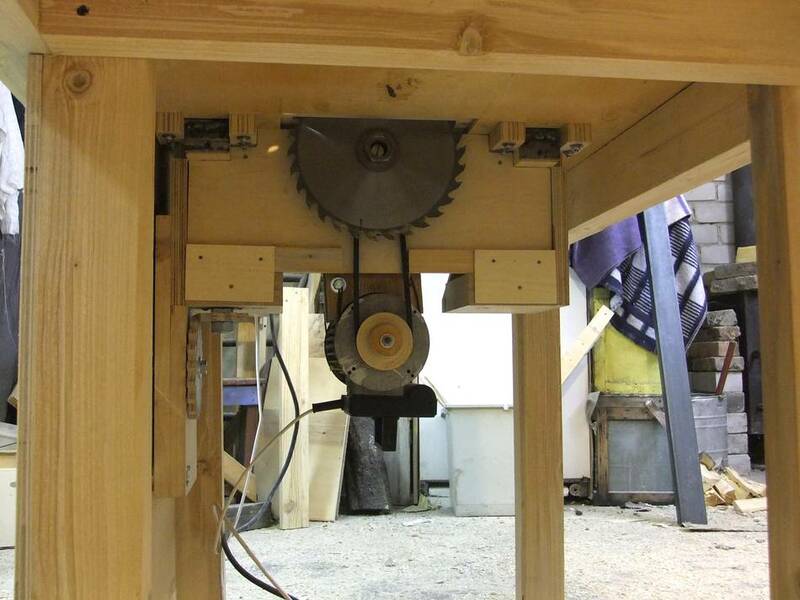 John Heisz's saw has a small motor close to the arbour. 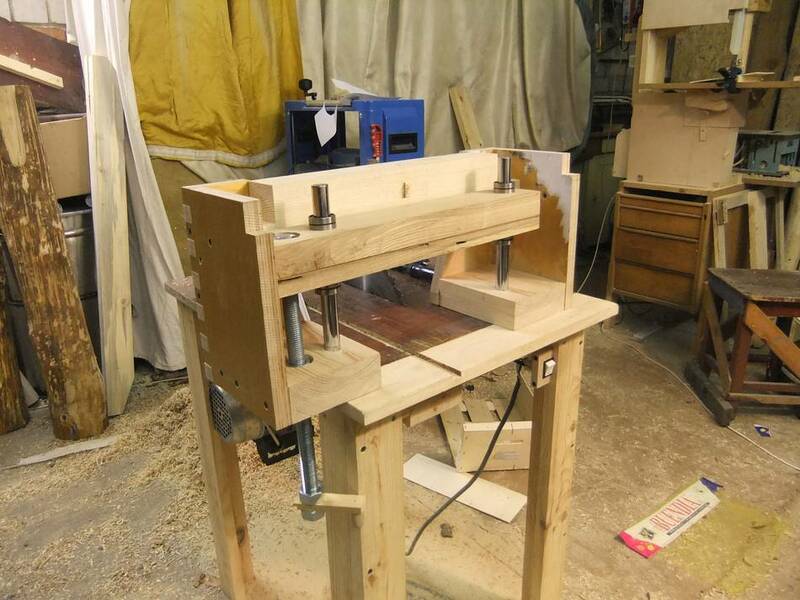 The tilt adjust on my dad's Felder saw works similar, but also with the motor closer, and a really sturdy lever to tilt the saw with. That one is also hard to adjust. The underside of the saw with, unfortunately, everything covered to repel dust. Although, you can see gears! The table top is made from poor quality birch/pine plywood, 80x40mm. A steel tube acts a rail for Biesemeyer-style fence. 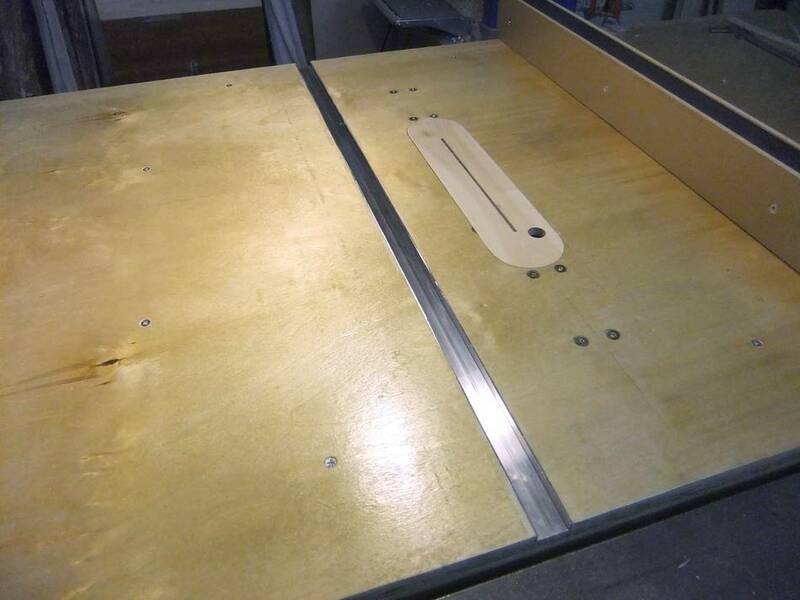 A 25mm wide aluminum "U profile" is glued in a routed groove to act as a miter slot. The saw after use for couple weeks. The fence is made from the same 80x40mm tube with cam-lock which doesn't work as well as commercially made ones, but it's good enough for me. 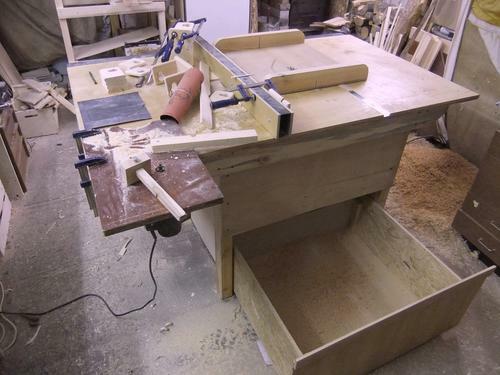 I also made big drawer for sawdust which turned out to be a great idea. Fun to look at the pictures. 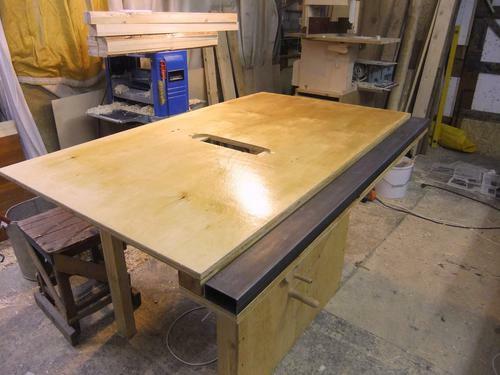 I see a homemade bandsaw, homemade disk sander, homemade marking gauge, and your earlier homemade table saw!